Glaucoma is a term describing a group of ocular disorders with multi-factorial etiology united by a clinically characteristic intraocular pressure-associated optic neuropathy. This can permanently damage vision in the affected eye(s) and lead to blindness if left untreated. It is normally associated with increased fluid pressure in the eye (aqueous humour). The term “ocular hypertension” is used for people with consistently raised intraocular pressure (IOP) without any associated optic nerve damage. Conversely, the term ‘normal tension’ or ‘low tension’ glaucoma is used for those with optic nerve damage and associated visual field loss, but normal or low IOP. The nerve damage involves loss of retinal ganglion cells in a characteristic pattern. The many different subtypes of glaucoma can all be considered to be a type of optic neuropathy. Raised intraocular pressure (above 21 mmHg or 2.8 kPa) is the most important and only modifiable risk factor for glaucoma. However, some may have high eye pressure for years and never develop damage, while others can develop nerve damage at a relatively low pressure. Untreated glaucoma can lead to permanent damage of the optic nerve and resultant visual field loss, which over time can progress to blindness. Glaucoma can be roughly divided into two main categories, “open-angle” and “closed-angle” (or “angle closure”) glaucoma. The angle refers to the area between the iris and cornea, through which fluid must flow to escape via the trabecular mesh work. Closed-angle glaucoma can appear suddenly and is often painful; visual loss can progress quickly, but the discomfort often leads patients to seek medical attention before permanent damage occurs. Open-angle, chronic glaucoma tends to progress at a slower rate and patients may not notice they have lost vision until the disease has progressed significantly. 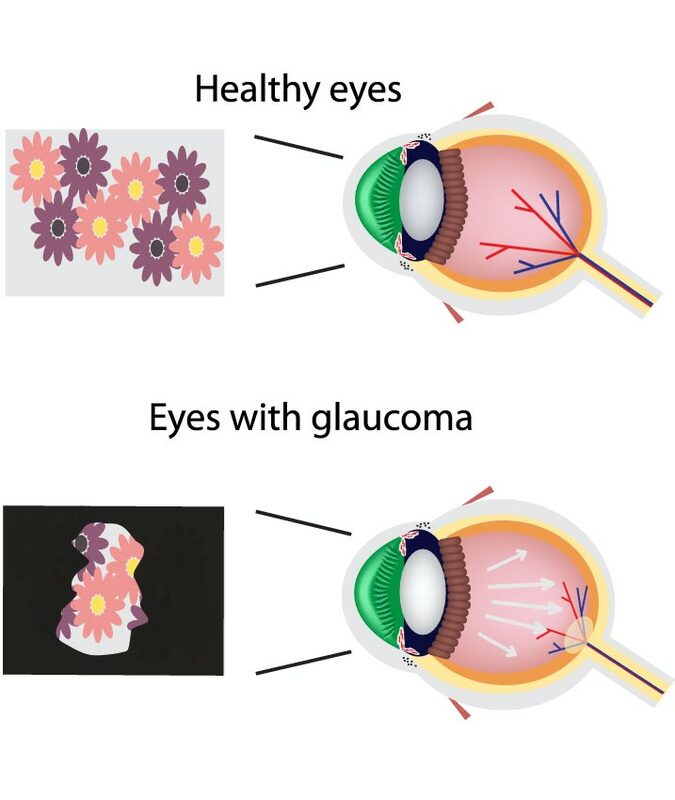 Glaucoma has been called the “silent thief of sight” because the loss of vision often occurs gradually over a long period of time, and symptoms only occur when the disease is quite advanced. Once lost, vision cannot normally be recovered, so treatment is aimed at preventing further loss. Worldwide, glaucoma is the second-leading cause of blindness after cataracts. It is also the leading cause of blindness among African Americans. Glaucoma affects one in 200 people aged 50 and younger, and one in 10 over the age of eighty. If the condition is detected early enough, it is possible to arrest the development or slow the progression with medical and surgical means.